Not only is the Google autonomous car changing things, semis and heavy equipment are ripe for automation. 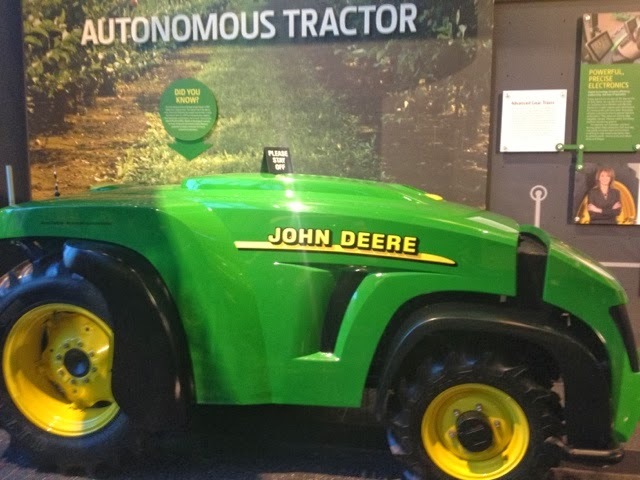 In fact back in 1997 John Deere started working on an autonomous tractor. Steadily they have been introducing features to tractors that allow a more automated tractor, and less chance for operator error. One of the most expensive parts of a tractor is the cab. Without it the whole machine would be less expensive. Cab-less vehicles also open up the possibility of true 24 hour operation. With infrared cameras to spot people and animals a cab-less tractor might not even need lights to run at night. Certainly, we aren't there yet. Do you want to be the guy trying to hitch an implement to an autonomous tractor backing up? What if it doesn't stop? Also, what if your kid runs out in the field in front of the tractor? Finally, how do you transport the tractor and the implement two miles to your next field? Overall, the method of a tractor with a person driving pulling an implement has not changed in decades, it is an industry ripe for disruption.